The Miami Dolphins had a string of 13 straight home-opening wins on the line as they hosted the Buffalo Bills on September 10, 1989. However, the Dolphins were coming off a 6-10 record in ’88 and had not been to the playoffs in four years. Head Coach Don Shula’s team was always productive through the air with QB Dan Marino, but the running game was not up to par and the defense ranked 26th in the league. The Bills, coached by Marv Levy, appeared to be heading in a better direction. Following four consecutive losing years, they won the AFC East with a 12-4 tally in 1988. Tough and talented QB Jim Kelly (pictured above) led an offense that featured RB Thurman Thomas, coming off an outstanding rookie season, and WR Andre Reed, who set a club record with 71 receptions. The defense was anchored by DE Bruce Smith and included solid linebackers Cornelius Bennett and Shane Conlan plus overachieving FS Mark Kelso. There were 54,541 fans in attendance at Joe Robbie Stadium. The Dolphins drove into Buffalo territory on their first series but were forced to punt, pinning the Bills back at their one yard line. However, the visitors proceeded to put together a long 16-play, 82-yard drive. Thurman Thomas ran seven times for 39 yards and Jim Kelly completed three passes. The possession finally stalled at the Miami 17 and Scott Norwood kicked a 34-yard field goal. The score remained 3-0 as the game entered the second quarter. The teams exchanged punts before the Dolphins went 71 yards in 10 plays. Dan Marino tossed six completions, the longest of which were 20 yards to TE Ferrell Edmunds and 21 yards to WR Mark Duper, and RB Troy Stadford ran for the final yard and a touchdown. Pete Stoyanovich’s extra point put Miami ahead by 7-3. The teams again traded punts until the Bills, starting off at the Miami 45 after a 14-yard return by DB Erroll Tucker, put together a promising drive. Kelly completed four passes, but on the last, Andre Reed fumbled inside the ten and CB Rodney Thomas recovered and ran 39 yards. With 32 seconds left in the half, Marino threw to WR Jim Jensen for 10 yards and a pass interference penalty moved the ball to the Buffalo 11. Stoyanovich kicked a 29-yard field goal and the home team took a 10-3 lead into halftime. The Bills had the first series of the third quarter, punted, but soon regained possession when CB Nate Odomes forced Stradford to fumble and Cornelius Bennett recovered at the Miami two. From there, FB Larry Kinnebrew ran for a TD on the next play and Norwood’s extra point tied the score at 10-10. The Dolphins drove to midfield on their next series but had to punt. Starting from their own 11, the Bills reached the 27 before Kelly was sacked by LB Barry Krauss on third down for a 17-yard loss, and John Kidd’s punt was blocked by Jensen, with RB Marc Logan running it in for a touchdown. Stoyanovich added the PAT and Miami was back in front at 17-10. The Bills put together a 10-play, 52-yard series in response. Kelly completed an eight-yard pass to Reed to convert a third-and-five situation and also threw to RB Ronnie Harmon for 20 yards along the way. Norwood booted a 37-yard field goal to narrow the score to 17-13. The Dolphins were driving as the period ended, with Marino completing three passes, the first to RB Tom Brown for 23 yards. But after reaching the Buffalo 27 early in the fourth quarter, Odomes intercepted a pass to end the threat. The teams exchanged fumbles deep in Buffalo territory and the Bills were then able to punt the ball away. However, the Dolphins put together a long drive of 73 yards in 12 plays, with seven of them pass completions by Marino. The last was to WR Andre Brown for a touchdown and, with Stoyanovich adding the extra point, the home team was in front by 24-13 with 4:17 remaining on the clock. The Bills came out throwing following the ensuing kickoff and, after an incompletion on first down, Kelly connected on five straight passes, the last to WR Flip Johnson for a 26-yard TD. Norwood added the extra point, but the Bills were behind by four points and still needed a touchdown to win. It looked good for the Dolphins on the next series when Marino completed a pass to Edmunds for the necessary yards on a second-and-14 play, but Odomes picked off another pass and the visitors had possession at their 49 with the time remaining now down to 1:44. Kelly completed three straight passes, two of them to WR Chris Burkett, to gain 21 yards. Following an incompletion, he hit Thomas for 11 yards, Reed for 15 and, with an offside penalty moving the ball half the distance to the goal, Kelly ran the ball himself out of shotgun formation for a two-yard touchdown – his first ever rushing touchdown in the NFL (he had six in the USFL). In dramatic fashion, the Bills came away the winners by a score of 27-24. Buffalo had the edge in total yards (367 to 323) and first downs (27 to 20). The Dolphins turned the ball over four times while the Bills suffered two turnovers. However, Miami sacked Kelly four times while Buffalo failed to get to Marino at all. Jim Kelly completed 25 of 40 passes for 265 yards and a touchdown with no interceptions in addition to running for a TD. 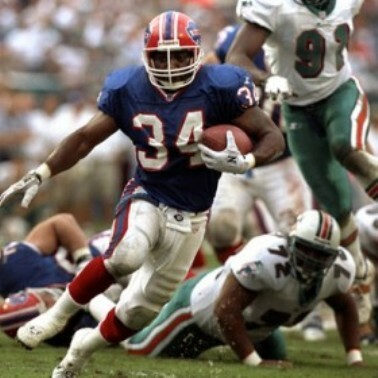 Thurman Thomas (pictured below) gained 94 yards on 13 rushing attempts and caught 8 passes for 65 more yards. 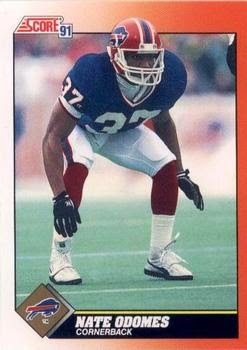 Andre Reed had 6 catches for 58 yards and Flip Johnson gained 60 yards and scored a touchdown on his three receptions. Nate Odomes had a hand in three of the four Buffalo takeaways with two interceptions and a forced fumble. For the Dolphins, Dan Marino was successful on 25 of 38 throws for 255 yards and a TD but gave up two interceptions. Ferrell Edmunds caught 5 passes for 58 yards and Tom Brown was right behind with 5 for 57 yards. Andre Brown gained 58 yards on his four receptions that included a score. “We felt good about ourselves. We felt real confident. Then it was like this huge building fell on us,” said Miami G Roy Foster in summing up the defeat. Buffalo continued on to an 8-4 start but tailed off amid much off-field griping to finish at 9-7. It was still enough to again top the AFC East, but the Bills lost to Cleveland in the Divisional playoff round. For the Dolphins, the loss to Buffalo was their tenth straight to AFC East teams and set the tone for a 1-3 start, although they then won six of seven before losing four of their last five games to end up at 8-8 and end up third in the division. 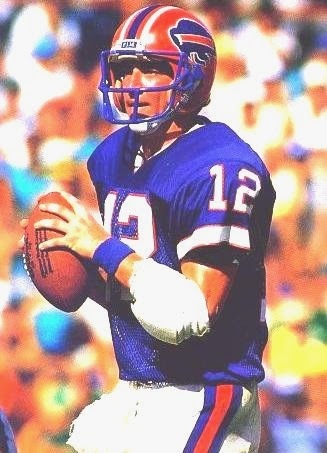 Jim Kelly missed three games with an injured shoulder and was in the midst of some of the locker room bickering, but passed for 3130 yards and 25 touchdowns. He also had a second rushing TD during the season. Thurman Thomas was selected to the Pro Bowl after gaining a NFL-leading 1913 yards from scrimmage, which included 1244 on the ground. Andre Reed led the AFC in pass receptions, breaking his own club record with 88 catches that were good for 1312 yards and nine touchdowns.